Inquiry held at the County Buildings, Glasgow, on the 17th and 18th February, 30th March and 1st April, 1936, before George Wilton Wilton, K.C., one of the Sheriff Substitutes of Lanarkshire, assisted by Captain W. E. Whittingham, O.B.E., R.D., R.N.R., and Captain Piers de Legh, Nautical Assessors, into the circumstances attending the loss of the s.s. Clan Malcolm" of Glasgow on the 26th September, 1935, off the east side of Beast Point near the Lizard Head, while on a voyage from Durban by London to Glasgow. Upon the evidence led at the Inquiry and for the reasons stated herein and in the Annex to this Report, the Court finds that the vessel was lost through the default of the master of the vessel, John Pollock. The Court suspends the master's certificate for a period of twelve months from this date, 1st April, 1936. 1. Q. Who were the owners of the s.s. "Clan Malcolm"? The owners of the s.s. "Clan Malcolm" were the Clan Line Steamers, Limited, of 109, Hope Street, Glasgow. 2. Q. What was the cost of the s.s. "Clan Malcolm" to her owners? What was her value when she last left the Port of London? What insurances were effected upon and in connection with the ship ? The cost of the s.s. "Clan Malcolm" to the owners was £104,586. Her value when she last left the Port of London was £39,276. The insurance on her hull and machinery was £39,000 and on her freight £2,594. 3. Q. What number of compasses had the vessel? Were they in good order and sufficient for her safe navigation? When and by whom were they last adjusted? The vessel carried three compasses. They were in good order and sufficient for her safe navigation. The standard compass was last adjusted on the 11th June, 1929; the steering compass on the 30th September, 1934; and the after compass on the 8th October, 1921. 4. Q. Had the master ascertained the deviation of the compasses by observation from time to time? Had the errors been correctly ascertained and recorded and did the master know the proper corrections to be applied to the courses steered? The master had ascertained the deviation of the compasses by observation from time to time. The errors had been correctly ascertained and recorded and the master knew the proper corrections to be applied to the courses steered. 5. Q. What sounding appliances were on board the vessel when she left London on her final voyage? Were they sufficient for the voyage which she was undertaking? The vessel had on board a Whyte-Thomson sounding machine, a Wigzell patent atmospheric depth-recorder and the usual necessary tubes, a deep sea leaded line and two hand leaded lines. These were sufficient for the voyage she was undertaking. 6. Q. Was the vessel fitted with a direction finder? If so, was it in good order? The vessel was fitted with a direction finder, and it was in good order. 7. Q. What (a) charts; (b) sailing directions were on board the vessel when she left London? Were they sufficient for the voyage which she was undertaking? The vessel had all necessary charts and sailing directions when she left London, which were sufficient for the voyage she was undertaking. 8. Q. Was the position of the vessel fixed. when she was off Start Point on the 26th September, 1935? If so, at what time and how was the position fixed, and was the fixing accurate? The position of the vessel was fixed when she was off Start Point on 26th September, 1935, at 3.8 p.m. by cross bearing, and the fixing was accurate. 9. Q. How far was the vessel off Start Point at the time when her position off Start Point was fixed? The vessel was 8 miles off Start Point when her position was fixed. 10. Q. On what course and at what speed was the vessel being navigated when her position off Start Point was fixed? When her position off Start Point was fixed she was on a S.80.W. (true) course and her speed was about 11 knots. 11. Q. What were the conditions of (a) the weather; (b) the wind; (c) the visibility; (d) the tide, when her position off Start Point was fixed ? The conditions were: (a) The weather was fine and clear and a smooth sea; (b) Wind S.W. ; (c) Visibility good; (d) The tide was the last of the ebb tide. 12. Q. Was any alteration made in the course of the vessel when she left her fixed position off Start Point? If not, how far should the course on which she was being navigated have taken her clear of the Lizard Point? No alteration of course was made when the vessel left her fixed position off Start Point. This course should have taken the vessel 3 miles off the Lizard Point. 13. Q. Were any shore lights seen from the vessel after she left her fixed position off Start Point? No shore lights were seen from the vessel after she left her fixed position off Start Point. 14. Q. Were any lights of other vessels seen from the s.s. "Clan Malcolm" after she left her fixed position off Start Point? If so, how did they bear and what was their distance from her? The master and chief officer stated in their evidence that several vessels were seen after the vessel left her fixed position off Start Point. These vessels were passing her to the north and south and steering to the eastward. At 7.45 p.m., the master states, he sighted the lights of a steamer bearing north, distance 4 to 5 miles, steering to the eastward. The Court cannot accept this evidence in view of the weather conditions. 15. Q. Were any, and if so what, alterations made in the course of the vessel after she left her fixed position off Start Point? If so, when were they made? No alteration in the true course was made after the vessel left her fixed position off Start Point until 8.44 p.m. when it was altered 3 points to the southward; this was 7 minutes before the vessel struck. 16. Q. Were any, and if so what, alterations made in the speed of the vessel after she left her fixed position off Start Point? If so, when were they made? No alteration in the speed of the vessel was made after she left her fixed position off Start Point until 8.44 p.m. when the engines were put half-speed. 17. Q. Were any soundings taken from the vessel after she left her fixed position off Start Point? If so, (a) how many such soundings were taken; (b) what depths were recorded by those soundings; (c) what bottom was found by those soundings? (a) One sounding was taken; (b) Depth recorded, 44 fathoms; (c) Bottom was sand and shells. 18. Q. If soundings were taken, were they proper and sufficient? If they were not taken, should they have been taken? The Court considers the soundings were not sufficient. 19. Q. Were the course or courses on which the vessel was navigated after she left her position off Start Point safe and proper in the circumstances? Was any allowance made for tide and currents, wind and set of sea? If not, should an allowance have been made? The course on which the vessel was navigated after passing Start Point was a safe and proper one up to the time the Eddystone Lighthouse was abeam which was not sighted owing to hazy weather. The course should then have been altered to the southward to make an allowance for any possible set to the northward by tide and current wind and set of sea. No allowance was made for tide and current, etc. An allowance should have been made. 20. Q. Were the speed or speeds at which the vessel was proceeding after she left her position off Start Point safe and proper, having regard to (a) the state of the weather; (b) the knowledge ascertained of her position? The speed at which the vessel was proceeding after she left her position off Start Point to 8 p.m. was safe and proper; but the Court considers that, having regard to (a) the state of the weather and (b) the knowledge ascertained of her position, at 8 p.m. the vessel's speed should have been reduced. 21. Q. Were any wireless bearings taken from the vessel after she left her position off Start Point? If not, should they have been taken? No wireless bearings were taken from the vessel after she left her position off Start Point. The master in his evidence states he told the wireless operator at 8 p.m. to get a wireless bearing of the Lizard, but that the operator stated to him that he was unable to do so on account of the jamming of ships and shore stations. It has since been ascertained that the Lizard Wireless Station has been closed down for over a year. The Court considers that the master and wireless operator should have known this. The Court also considers that wireless bearings from Land's End and other stations should have been obtained long before the vessel reached a position anywhere near the Lizard. 22. Q. After the vessel left her position off Start Point, was she navigated with proper and seamanlike care? After the vessel left her position off Start Point till the time Eddystone should have been abeam the vessel was navigated with proper and seamanlike care; but, after that, she was not navigated with proper and seamanlike care. 23. Q. During that period was a good lookout kept on board the vessel? A good lookout was kept on board the vessel. 24. Q. When and where did the vessel strand? 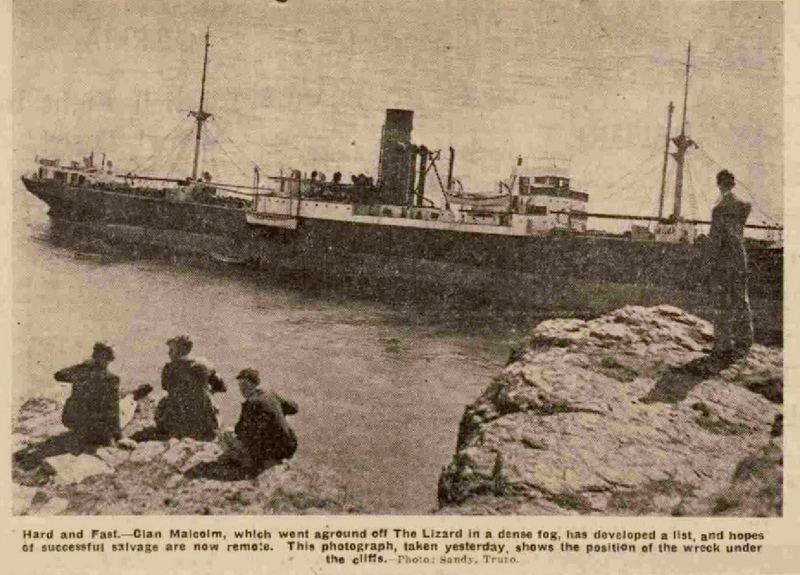 The "Clan Malcolm" stranded at 8.51 p.m. on the 26th September, 1935, at Beast Point about 11/4 miles to the eastward of the Lizard Head. 25. Q. What was the cause of the stranding of the s.s. "Clan Malcolm"? The stranding of the s.s. "Clan Malcolm" was due (a) to the master not having altered his course when he failed to sight the Lizard Light, knowing the weather was foggy; (b) to his failing to take sufficient soundings; and (c) to his failing to get direction finding bearings. 26. Q. After the vessel stranded were all proper steps taken to preserve her from total loss ? After the vessel stranded all proper steps were taken to preserve her from total loss. 27. Q. Were the stranding and subsequent total loss of the s.s. "Clan Malcolm" caused by the wrongful act or default of her master, Captain John Pollock? The stranding and subsequent total loss of the s.s. "Clan Malcolm" was caused by the default of the master, Captain John Pollock, as stated in the Answer to Question No. 25. Dated at Glasgow this first day of April, 1936. We concur in this Report. In this Inquiry, Mr. Thomas Walker Donald, Solicitor, of Messrs. McGrigor, Donald & Co., Solicitors, Glasgow, appeared for the Board of Trade; Mr. James Paterson, Writer, of Messrs. Wright Johnston & MacKenzie, Writers, Glasgow, represented John Pollock, master of the s.s. "Clan Malcolm", a party in the Inquiry, and Mr. Paterson also attended for the Clan Line Steamers, Limited, Glasgow, as owners thereof. Mr. Archibald Hamilton, Solicitor, of Messrs. Maclay Murray & Spens, Solicitors, Glasgow, watched the proceedings on behalf of David John Morris, chief officer of the vessel. The "Clan Malcolm", official number 137,837, was a single screw steel steamship, built by Craig Taylor & Co., Limited, of Stockton-on-Tees in 1917 and classed A.1, British Corporation. Her registered tonnage was 5,994.02 gross and 3,723.96 net, and her registered dimensions were as follows: Length 405.1 feet, main breadth 53.35 feet and depth 36.11 feet. She was a double deck, fore and aft schooner rigged, clincher built steamship, with elliptic stern, and was fitted with one steam vertical triple compound direct-acting surface condensing engine of 560 nominal horse power and 2,600 indicated horse power, giving her a speed of 11 knots. She had three cylindrical multitubular boilers with a loaded pressure of 180 lbs. and three cylinders. She carried a crew of 71, including the master. She was a flush deck vessel, had five cargo holds, three forward and two aft, and had six bulkheads and nine water ballast tanks including the deep tank. She carried four boats, six life-buoys and 86 life-belts. 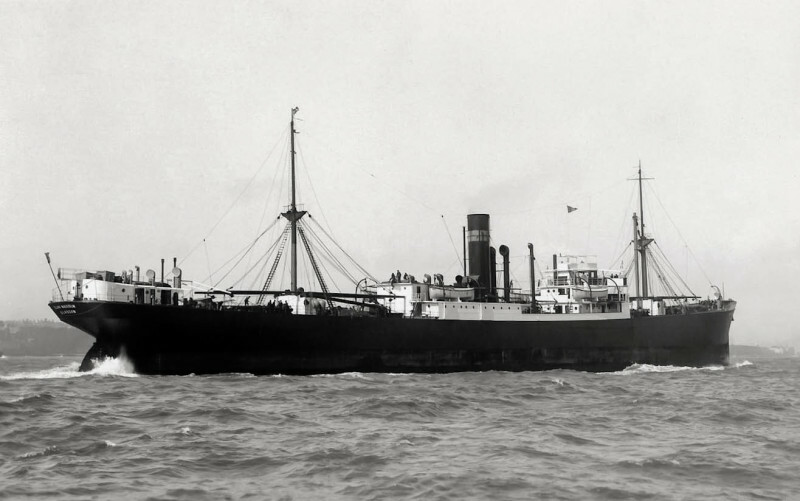 The "Clan Malcolm" sailed from Durban on the 20th August, 1935, bound for London and Glasgow. She arrived in London on the 21st September. She left London at 2 p.m. on the 25th September bound for Glasgow with about 3,500 tons of maize and maize products on board, her draughts being 13 ft. 10 ins. forward and 21 ft. 5 ins. aft. The Board of Trade proved by the evidence of Thomas Wallace Young, marine superintendent in the service of the owners of the vessel, all the usual particulars with regard to it, and as these are stated in answer to the Questions relating thereto as submitted to the Court by the Board, and satisfied the Court that, prior to and at the time of the stranding and loss, the vessel was well maintained and equipped and was in every respect seaworthy and carried all necessary compass, sounding and wireless (ordinary and direction finding) instruments, all in order, with charts and navigation books. No suggestion to the contrary was made in any way by the master or any other officer or any member of the crew. The master expressed his content with the vessel and all its equipment. At the beginning of the Inquiry the master was not legally represented, but at the close of his examination-in-chief by Mr. Donald for the Board of Trade, Mr. Paterson. who had attended the Inquiry up to that time on behalf of the owners, agreed upon the invitation of the Court to represent the master for the remainder of the Inquiry. The master had travelled from Dublin without arranging for any legal assistance. The Court and the Assessors expressed their indebtedness to Mr. Paterson in undertaking the master's interests upon such short notice. Mr. Paterson consulted with the master during an interval allowed for that purpose on the first day of the Inquiry. The vessel stranded about 8.51 p.m. (B.S.T.) on the 26th September, 1935, within some 200 yards from the rocks or cliffs below the signal station at Beast Point on its east side and near the Lizard. All the hours given in this Annex are stated as B.S.T. The only question raised by the Inquiry is as to how the vessel got so close to such a dangerous shore. It was not disputed that no vessel should pass off the Lizard in normal circumstances nearer than three or three and a half miles and that such distance might be reasonably and safely maintained only so long as the Lizard and coast line could be clearly seen. After discharging part of her Durban cargo in London, the vessel left London at 2 p.m. on the 25th September, 1935, well found in all respects, and appeared to be going well for the rest of that day and up to about 4 p.m. of the next day. Her position at noon that day had been fixed at 50° 12' N., and 2° 35' W. Her course was then set by the master to make S. 80° W. (true), as noted in the ship's log book. Start Point was abeam at 3.8 p.m., bearing N. 10° W. (true), distance 8 miles. At 4 p.m., some 13 miles from Start Point Light, the master had cross bearings taken of Start Point and Bolt Tail when the position fixed the vessel as half a mile or so to the south of the course set at noon. The weather was then hazy, Eddystone Lighthouse fog signal being sounded from 3.25 p.m. About 5.30 p.m., when the master believed he was passing Eddystone Lighthouse at a distance of about 10 miles, there was, he stated, a slight haze obscuring the lighthouse. The vessel was steaming at 11 knots with a distance to cover from there to the Lizard of about 37 miles. Sunset was at 7.5 p.m. Visibility had decreased from 4 p.m. with drizzling rain and, as recorded at the Lizard, with fog from 4.30 p.m., fog signals being sounded. At 7.45 p.m. the chief officer, then on the 4 to 8 watch, called the master to the bridge and informed him that he thought the vessel was then some 12 miles off the Lizard. It had been dark from 7.30 p.m. The chief officer stated to the master that he had expected to see the Lizard Light at 7.45 p.m. but had not seen either the light or its glare. The master was on the bridge at 8 p.m. for the purpose of seeing the light, normally lit and seen in good weather by that time. The master and the chief officer, who remained on the bridge with the third officer on the 8 to 12 watch, failed to see the light; visibility, according to the master, was then 5 to 6 miles. The wind then was south-west, force 4, and the sea was slight with a swell from the south-west, while the tide was almost slack water (high water at Dover being at 10.45 p.m. G.M.T.). At 8.15 p.m. the third officer reported to the orders of the master his having sounded 44 fathoms and this is marked by the master on the ship's chart. At 8.35 p.m. the master ordered the chief officer to take another sounding; but the result of this sounding, if taken, was never reported to him. The master at this time stated that he instructed Alexander Paterson Goodman, the wireless operator, to get a wireless bearing, but up to 8.40 p.m. the master received no report from him. The Court considered that from 7.45 p.m. to 8.30 p.m. the position of the vessel was a matter of anxiety to the master and the chief officer and rendered it essential that all known precautions by soundings and wireless cross bearings should have been taken by the master. Beyond what has been narrated, nothing more was done. Up to 8.40 p.m. the master had not seen the light of the Lizard. The master gave the chief engineer orders at 8.41 p.m. for "Stand by", at 8.44 p.m. "Half speed", and, hearing a fog signal on the starboard bow, the master altered the ship's course three points to the southward, with a further order for "Slow" to the chief engineer. At 8.51 p.m. the vessel struck the rocks and the master ordered "Full astern" and immediately afterwards rang "Stop". The vessel went hard aground on the rocks, ripping her bottom. The master up to this time had never seen the Lizard Light. The tide was then running out to the westward and should have been carrying him out to sea. It was found impossible to save the vessel. The master stated that he could only account for the vessel being inside her course by three miles or so from 4 p.m. by what he described as "an abnormal northerly set" due to "a recent very hard gale of 80 miles or so per hour". The master admitted that in setting the course of the vessel before and after Start Point he had made no allowance for tide or current; that the matters of lee-way, swell or set had not been present to his mind when fixing the course; that after 4 p.m. he had never verified it; that he continued sailing after 7.30 p.m. without seeing the Lizard Light, although then normally expecting to see it; that he accounted for his not seeing the Lizard Light by the tide turning against the vessel for part of the time and leading him to believe that the vessel had not run her distance. Both the master and the chief officer spoke to seeing lights of passing vessels in the Channel and to one light of a vessel in-shore prior to 8 p.m.; but no communications were made with any of these vessels. The master admitted that the stranding of the vessel showed that he should have allowed a wider margin. He also explained that, through the third officer, he had endeavoured at 8 p.m. to get his position by the wireless direction finder; but he stated that the wireless operator reported that the Lizard Station was "jammed". The wireless operator was not adduced as a witness by the Board of Trade. The wireless log contains no record of any bearing. On the conclusion of the evidence led on the first and second days of the Inquiry, Mr. Donald was desired by the Court to ascertain whether there were at the Wireless Telegraphy Station at the Lizard records of any wireless communications from the vessel on the 26th September, 1935, prior to its stranding, as to any request for wireless telegraphy direction finding bearings, and to be furnished with certified copy of the entries. The Court further desired evidence from Lizard Lighthouse or Coastguard Station at Lizard as to the direction and force of the wind and state of the weather for the period from Wednesday, the 18th September, to Wednesday, the 25th September, 1935, both dates inclusive, and to know whether in the knowledge of the Coastguard officials in charge during that period there was any abnormal northerly "set" operating in the vicinity of the Lizard by reason of any gale or storm, with certified copy of the entries from the Lighthouse and Coastguard Journals. The Court then adjourned the sittings to the 30th March, 1936. At the adjourned session on the 30th March, 1936, Mr. Donald, for the Board of Trade, submitted to the Court all the information the Board of Trade had been able to procure in reference to the requests made by the Court at the previous sitting. These included certified excerpts from the Lizard Lighthouse and Lizard Coastguard Station relative to weather and visibility from the 17th to the 26th September, 1935, and from Land's End Wireless Station for the 25th and 26th September, 1935, together with a minute sheet of the Board of Trade. That minute sets forth that (1) the Admiralty Hydrographic Department have no source of information as to the set of the tide at or near the Lizard on the 25th and 26th September, 1935; (2) there was and is no Wireless Telegraphy Station at the Lizard Lighthouse; (3) the Lizard Lighthouse is covered by the Wireless Telegraphy Station at Land's End; and (4) there were no wireless messages or warnings transmitted on these dates as to tidal sets. The Journal of the Lizard Lighthouse for the period from the 18th to 26th September, 1935, inclusive, shows mainly calm or ordinary weather during the whole of that time with a wind (force 5) on the 18th September from S.W. from 3 p.m. increasing to forces 6 and 7 from S.W. or S.S.W. from 6 p.m. to 3 a.m. of the 19th September; then changing to W.S.W. and decreasing to force 4 on the 20th September by 3 a.m.; then increasing to force 5 by 9 a.m. and thereafter with wind W. decreasing to force 3 by 6 p.m., after which the wind changed to the east never being above force 3 to midnight of the 21st September when it changed to the south-west and then turning north-west or north from 3 a.m. of the 22nd September to noon on the 23rd September with no force more than 5; and thereafter W.S.W. or S.S.W. until 3 p.m. of the 24th September with no force more than 5, changing to W.S.W., W.N.W., N.W. until midnight of the 25th September, decreasing to force 2. On the 26th September, as shown from the Journal of the Lizard for that day and produced at the first day of the Inquiry, weather was calm up to 3 p.m., and thereafter ordinary moderate or fair until the stranding of the vessel, with wind S.S.W. after noon and never more than force 5; fog signals sounded from 4.30 p.m. The Board of Trade, through Mr. Donald, intimated that the only local information supplied to the Board as to any tidal set was that purporting to be given by the coxswain of the Lizard Branch of the Royal National Lifeboat Institution to the effect that on the first of the ebb tide with an out wind there was an "inset" of the tide towards the land; but that such an "inset" would not have been sufficient to affect the vessel. Extracts from the Log of Land's End Wireless Station for the 26th September, 1935, show that, while there were communications between the Station and the vessel about noon that day, there were no communications of any kind from that time until 8.54 when the vessel opened distress communications with the station, at 8.55, intimating her actual grounding. No communication was made between the vessel and the Station in reference to her position or making any request for bearings that day prior to 8.54. Extracts from the Lizard Journal as to the weather, visibility, wind, &c., during the week after the 19th September up to noon on 26th September, show no wind force higher than 5. No further oral evidence was led at the adjourned Inquiry. Mr. Paterson on behalf of the master maintained that no fault in seamanship had been proved against him, and that at the worst, if any error on his part had occurred, it was that of judgment. Mr. Paterson informed the Court that he had duly communicated to the master the contents of the additional productions made by the Board of Trade. The master had not acknowledged his letter of the 11th March, 1936. The master did not attend the Inquiry after the 18th February, 1936. Mr. Donald, for the Board of Trade, tendered the Questions proposed by the Board and submitted that, upon the evidence, oral and documentary (while he conceded that the course set for the vessel at noon on the 26th September was accurately fixed and had been properly checked when passing Start Point) the loss of the vessel was due to the fault of the master in neglecting to take the following precautions: (1) in his not making due and sufficient allowance for leeway in conditions of sea, wind and tide, all helping her to go inshore; (2) in going in fog or thick weather at full speed on a course making for the Lizard Head without verifying the position of the vessel against the Lizard Lighthouse by timeously taking a regular series of soundings or getting direction finding bearings; and (3) in not reducing speed or stopping, on failing to have such soundings taken or on not getting such bearings. The Court then intimated that the Assessors had only that day been put in possession of the additional documents and would require time to consider these with the whole evidence and other papers put in and that the judgment of the Court would be given on Wednesday, the 1st April, 1936. On the 1st April, 1936, the Court sat and gave judgment and read Answers to the Questions put by the Board of Trade. The Court is of an opinion that the master was right in setting a course from noon on the 26th September to pass three to three and a half miles off the Lizard without making an allowance for currents, &c., but when off Eddystone when the weather became foggy, he should have altered his course to the southward to pass about eight miles off the Lizard, and have taken frequent soundings and obtained direction finding bearings off Land's End and other stations. The Court also considers that the master should have altered his course well to the southward at 8.15 p.m. when it was still foggy and visibility very poor and the Lizard Light had not been sighted and the vessel was then only 61/2 miles off the Lizard. The Court also finds that there was no evidence adduced to justify the defence of the master that the loss of his vessel was due to any abnormal set to the northward. It was the duty of the master when making the Lizard to ascertain and make himself acquainted with any conditions in that locality mentioned in the Channel Pilot, Part I, pages 57 & 58. The master took no notice of those precautions and proceeded on the course he could have taken with safety in fine clear weather but not under the weather conditions prevailing at that time. In all these respects the Court finds the master guilty of negligence resulting in the loss of the vessel and suspends his certificate for twelve months from the 1st April, 1936. The Court, in concluding the Inquiry, expressed the view, in agreement with the representations made by Mr. Donald for the Board of Trade, that it was of the utmost importance that masters of all vessels navigating the English Channel, or other waters, should at all times make themselves thoroughly acquainted with all the information as to currents and tides contained in the Channel Pilot or other Guide Books issued by the Admiralty, and take all proper precautions necessitated by such information and particularly such precautions during hazy and foggy weather. On the application of Mr. Paterson on behalf of the master, the Court agreed to recommend to the Board of Trade that the master be granted a first mate's certificate during the period of suspension.